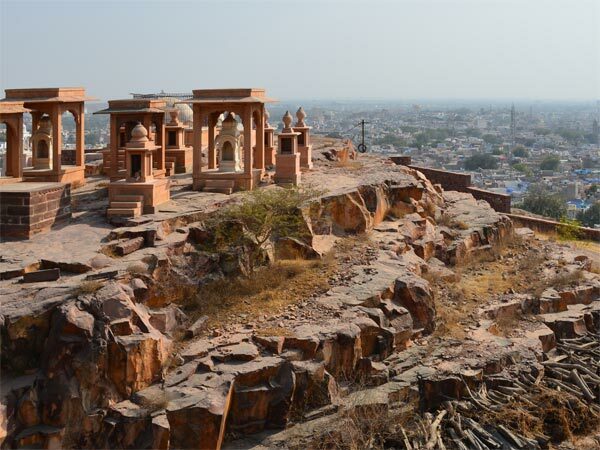 The state of Rajasthan boasts of some of the most beautiful, historic cities with a distinct feature of its own. One such city, which is a unique amalgamation of history and spirituality, is Ajmer, famous for the mausoleum of the 13th century Sufi Saint from Persia, Khwaja Moinuddin Chishti. The mystique and charm of the shrine, which draws people of all faiths throughout the year, made it a must-visit destination for us bunch of friends this holiday season. Being October, the temperatures already started declining (up to March); it's also the best time to visit the city. It is advisable to keep your luggage light if you are planning a one-day trip to Ajmer as it generally gets crowded this time of the year. On the day we landed, we took a quick but a worthwhile tour of the stunning Jodhpur, also known for its blue coloured homes. We closed the day early so as to make it on time for the morning train the next day. The breezy early morning and a hot cup of tea with biscuits at the station kick-started our spiritual journey. As the train chugged along, we were offered home-made pohas, chutneys, pickles and parathas by our fellow passengers, much to our surprise and delight! At 12 noon we reached Ajmer junction. When we walked closer to the Dargah, which is just a kilometre away from the station, everywhere we could see bright lights, tiny stalls selling colourful chaadars; and, despite the crowd, the fragrance of sandalwood was wafting in the air, which instantly set a reverent tone to the atmosphere. There are three gates that lead to the main Dargah. As a sign of respect, both men and women are required to cover their heads before entering the gates. We left our luggage at the cloakroom for a nominal fee before entering the first gate, which is a 60 ft tall Nizam Gate. There are two separate lines for men and women to enter via this gate. Upon entering, we also found a green and white mosque built by Akbar, called Akbari Mosque. Thereupon, we headed to the brightly coloured second gate called Shahjahani gate. There are two large drums called Nakkaras, fixed above this gate. The drums are used to announce the beginning of the Urs, which is an annual 6-day festival commemorating the death anniversary of the saint. Finally, we reached the third and last gate, the Buland Darwaza, marking the start of the tombs. On our way, we bought some flowers and chaadars to be offered at the shrine. Upon entering the Buland Darwaza, we found, on either sides, two huge degs (cauldrons), fixed to the ground wherein large amounts of rice, sugar, dry fruits and ghee are added to make the tabarruk (prasad), which is then distributed amongst the devotees. A little before the entrance is a beautiful porch called Begami Daalaan built by Emperor Shahjahan's daughter, Princess Jahan Ara, made up of white marble pillars and walls covered in gold with colourful inlay works consisting of Arabic inscriptions. The overhanging chandeliers add a touch of beauty and grandeur to the place. This area was used by the princess and other women for their frequent visits. From the Begami Daalan, we were led to the tomb of Saint Khwaja. The tomb is made of white marble inlaid with precious stones, smeared with sandalwood paste and alcohol-free perfumes. It is covered with expensive ghilaafs made of velvet and silk with gold and silver thread embroidery. We offered flowers and prayers over the tomb. As I closed my eyes to pray, I could almost feel my inner self sway to the chants and murmured prayers around me. The feeling of devotion and reverence soon turned into humbleness for being able to be in presence of the respected saint. When I eventually opened my eyes, it felt like I had travelled a thousand miles and back. As we were led out, without showing our backs to the tomb, we all stood in stoned silence for a while, almost hoping the moment never ended. Much after the feeling sank in, added with some nudging by other devotees, we moved on to view the Shahjahani Mosque, a fine example of Mughal architecture. We sat there for some time while some of us offered prayers. Unaware of how time flew, we were only reminded of it by the hunger pangs we felt coupled with all the jostling and pushing we did at the entrances. While there were many high-profile eateries, we opted for a local, open-air Madina restaurant close to the railway station. After helping ourselves to mouthwatering meals, we were too exhausted to venture out for another round of sightseeing. So, we decided to head to the railway station instead for our train back to Jodhpur. While waiting, our only topic of discussion was feeling of devotion, reverence and spiritual awakening we experienced at the darbar (court) of the Khwaja. Soon, the announcement was made for the approaching train for Jodhpur. As we heard the whistle of the train at the distance, we were overcome by the feeling of having left a piece of ourselves behind, yet taking something more with us-blessings of Khwaja! Rail: There are frequent trains from the Bhagat Ki Kothi station in Jodhpur to Ajmer. We opted for a train ride and booked ourselves the interconnecting Ranikhet Express, which leaves at approximately 6.30 am and takes around 5 1/2 hours to reach Ajmer junction. Road: Buses are the cheapest and take roughly 4 hours to reach. There are state-run buses, as well as some private operators. You can also hire a taxi, which may, however, cost you more. Air: There are no direct flights yet for Ajmer, but airports at Jodhpur and Jaipur are well connected to other major cities. From there, Ajmer is easily accessible by road and rail. We took the non-stop Mumbai-Jodhpur flight.